Cyanobacteria, also known as blue-green algae, are naturally found in fresh water in the U.S., and in Lake Champlain and other Vermont waters. Some types of cyanobacteria can release natural toxins or poisons (called cyanotoxins) into the water, especially when they die and break down. Cyanobacteria grow well in water that has high amounts of nutrients like phosphorous and nitrogen. Cyanobacteria can multiply quickly to form surface scums and dense populations known as blooms, especially during the warm days of late summer and early fall. In recent years, cyanobacteria blooms have occurred most often in northern sections of Lake Champlain—such as St. Albans Bay and Mississquoi Bay. Since 2003, the Lake Champlain Committee (LCC) has trained citizen volunteers to monitor for cyanobacteria at lakeshore locations. 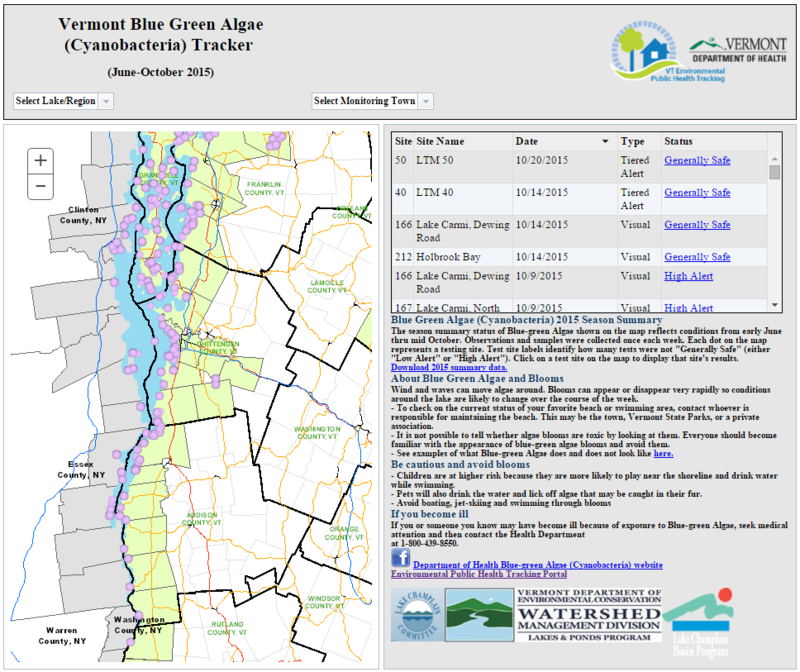 Volunteer monitors, along with staff from the Vermont departments of Health and Environmental Conservation, file weekly online reports that are then displayed on the Cyanobacteria Tracker Map. The program helps citizens, along with health, environmental and recreational officials, assess the safety of our beaches. It also provides important data to help us further understand when and why blooms occur. Not all Vermont bays, lakes, and ponds are monitored. Be aware of changing conditions, and keep out of the water if you think cyanobacteria may be present. NOTE: The map provides information and data as of the date of report. Test site observations and samples are collected once each week. Conditions can and do change. If you see cyanobacteria, don't go in the water. Curious about what cyanobacteria look like? Check out this video to help you learn how to identify cyanobacteria. No cyanobacteria blooms were found along these shoreline areas. These areas should be safe for recreational use. These shoreline areas have cyanobacteria at levels below bloom conditions. These areas are open for recreation, but caution is advised in any areas where dense accumulations or scums are seen. These shorelines have cyanobacteria in dense scums at least in some areas. The water is not safe for recreational use in areas that contain scums. Why do we have the Cyanobacteria (Blue-Green Algae) Tracker? While the map provides information on cyanobacteria conditions at the time of the report, lake conditions can change very quickly. It's important to know what cyanobacteria look like and use your best judgment when thinking about swimming or doing other activities in the water. To check current conditions at your favorite beach or swimming area, you can call whoever is responsible for maintaining the beach. This may be the town, a private association or Vermont State Park. Why is Cyanobacteria (Blue-Green Algae) a threat to public health? Swimming or wading in water with cyanobacteria may cause minor skin rashes, sore throats, diarrhea, stomach problems, or more serious health problems. Children and pets are at higher risk of exposure because they are more likely to play near the shoreline and drink water while swimming. Pets can also lick and swallow cyanobacteria that may be caught in their fur. The Vermont Tracking Program was featured in the Centers for Disease Control and Prevention's Tracking in Action video series. See how the Cyanobacteria (Blue-Green Algae) Tracker helps residents make informed decisions about recreational lake use.